Looking to “wow” that someone special? 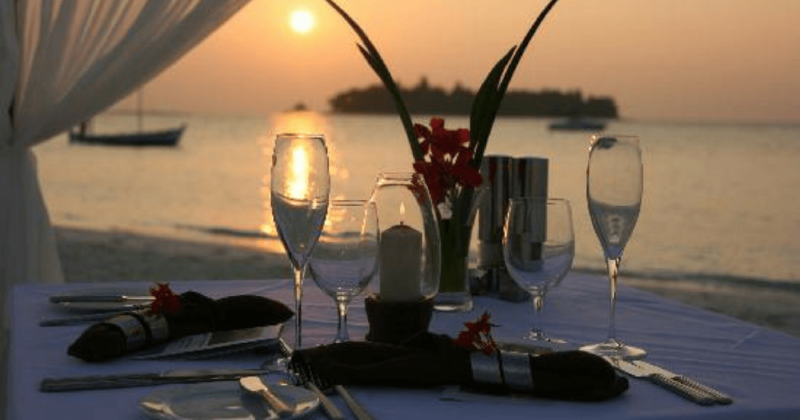 Then you need some tips to help you plan the perfect private beach dinner in Maui! Maybe you’re planning a special, romantic evening with the person you love. Maybe you plan a romantic surprise for someone you deeply care about. Either way, a private dinner at the beach is definitely going to impress! If you need help setting up your private dining event, here are some tips you should keep in mind. When do you plan to enjoy a private dinner? Make sure the weather will be on your side! Beaches can be extremely romantic. But bad weather conditions can quickly turn things around. Some wind or a cold breeze shouldn’t be a problem. You could bring blankets and have an ‘excuse’ to get closer to the person you love. But rain pouring down on you will probably ruin the whole evening. Before you book your private Maui chef, make sure the weather is suitable for a beach dinner for two. The moon and stars can be incredibly romantic! But trying to find your menu in the dark can make it difficult for you two lovebirds to fully enjoy your dining experience! Low lighting and candles, however, can help a great deal. You could decorate your improvised table with a romantic candle. You could also light the path to your special spot in the sand by using tiki torches or battery powered candles. When planning a private beach dinner in Maui, make sure the food choices match the theme of your evening. Oysters make for a great aphrodisiac. They’re also a great choice to include in your menu, since you’d be dining right on the beach. If seafood, however, is not your preferred dinner choice, discuss other foods that would best match your “intentions”. You can consult your private chef’s Menu choices and make a decision. Alternatively, you could use the menu as inspiration. A talented private Maui chef can definitely cater to your needs. You may be dining on the beach, but wearing your bathing suit during a romantic evening might not be such a good idea. Take into consideration the lighting will be low. Dressing up in your black clothes or jeans might not be something you should consider. Instead, go for a casual summer look. Bright colors and comfortable clothing are ideal. Don’t forget to wear proper shoes as well. Maybe let your partner know about your intentions, so they can avoid wearing high heels in the sand. Don’t forget about the wine and champagne! If your private beach dinner menu includes seafood, white wine is the perfect choice. Discuss these details with your private chef and be prepared for a wonderful, romantic evening! But don’t forget to hydrate as well! You may be dining near the ocean, but staying hydrated is your responsibility. Especially if you need to drive home after your romantic event.